The Arboretum has added two staff members to the research program in the last six months. Jessica Ross started as the citizen science coordinator in mid-September after spending several years in Chicago’s ecological sciences community. She earned her MS in botany, ecology, and conservation from Northwestern University in 2017. Her thesis research, conducted at the Chicago Botanic Garden, focused on fungal communities in the Yucatan. She also got involved with Chicago Botanic Garden research on soil microbial and plant communities of tallgrass prairies and worked on restoration projects in prairies, oak savannas, and wetlands. While working with the Echinacea Project, Jessica managed and supported citizen scientists whose work contributes to a better understanding of habitat fragmentation, population ecology, and pollinators in the Midwest. She also worked with the Field Museum to study monarch butterfly populations in urban environments, and she helped to develop a sampling strategy based on the Integrated Monarch Monitoring Protocol, a tool used by citizen scientists nationwide to study monarchs. Through the Field Museum’s Women in Science Internship program, Jessica mentored young women interested in pursuing careers in the sciences. Nancy Sheehan is the new citizen science coordinator for the Journey North program, which has moved to the Arboretum. Previously, she had been the program coordinator at the Rock River Coalition, managing the citizen-based stream monitoring program. 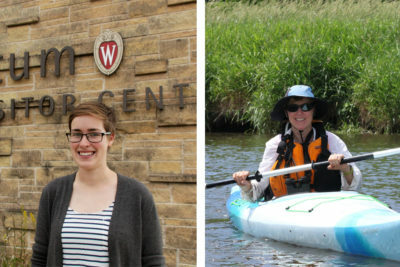 Nancy recruited, trained, and supported more than 200 volunteers to test water quality across the Rock River Basin using Wisconsin Department of Natural Resources standards. In 2014, She won the Stream Monitoring Award from the University of Wisconsin Extension and the Wisconsin Department of Natural Resources in recognition of her work. Nancy also worked with various agencies and watershed groups to integrate volunteer stream monitors into a regulatory program called Yahara WINs (Yahara Watershed Improvement Network), spearheaded by the Madison Metropolitan Sewerage District. Before the Rock River Coalition, Nancy worked for more than two decades as a consultant in natural resource education, outreach, and extension. She designed citizen-based monitoring projects and curriculum guides for clients that included area school districts and friends groups. Nancy earned a master’s degree in environmental management from the Yale School of Forestry and has completed doctoral studies at the UW–Madison Nelson Institute for Environmental Studies. As a PhD candidate she conducted participatory research on natural resource use and land tenure in The Gambia, West Africa, where she had previously served for three years as a U.S. Peace Corps forestry extension volunteer.